My freshmen year of college, I was required to take a physical education course, starting at 8:00am every Tuesday and Thursday. Those who know me, know that I would rather die than wake up to be somewhere at 8:00am on a consistent basis. They also know that my idea of hell is sweating for no apparent purpose except to fulfill a General Education Requirement. By the second week, the instructor called role and then released us without doing anything (a practice which – to my elation – he began to implement regularly throughout the semester) after a “facts-of-life” talk. He said that throughout our lives, we would be required to do things that were stupid and that did not make any sense – attending a physical education class as an undergraduate student being one such example. A part of college is learning how and when to do those things so that we can get ahead. Just because we showed up in time for roll call, we had fulfilled our obligation and could leave. I mention this to describe how I came across, bought, and devoured in one day a textbook entitled The Politics of the New Germany: 2nd Edition by Simon Green, Dan Hough, and Alister Miskimmon. For an internship seminar, I signed up to give a presentation on the German political parties and their positions on the German Sozialmarktwirstschaft System. On my own initiative, I had already written all of the major political parties with representation in the Bundestag, trying to set up meetings to learn more. (Note: The FDP - the Freie Demokratische Partei and a coalition partner of Angela Merkel’s CDU - was the only one who wrote me back. A representative met with me and I continued developing my interest by attending a meeting of the Julis, or the Junge Liberale.) To my dismay after signing up for my presentation slot, I discovered that my presentation would be due the following week during the visit of my mother to Berlin. I immediately ran to the closest English language bookstore – as I had no time or desire to read a bunch of German on such a time crunch – and bought this textbook. I spent the next day inside reading it from cover to cover. This book is, at its core, a textbook – and is packed with information. There is so much information in this book that I do not feel comfortable even offering a synopsis. Instead, I will share the basic topics covered in the book. The first chapter is entitled “Germany and the burden of history” which discusses the historical complication that we face when talking about the current political system. Essentially, “Germany found itself compelled to come to terms with the legacies of not just one but two (the Nazi and the East German) dictatorial regimes. Although the dictatorships had fundamentally different ideological goals and adopted different methods in attempting to fulfill them, they both restricted freedoms, denied civil liberties, eliminated the democratic process, and, to different extents and in different ways, disposed their enemies.” (page 22) The next two chapters entitled “Germany’s post war development, 1945-89” and “Towards Germany Unity?” essentially told the histories of how both East and West Germany developed following their creations. It also has an extensive section of charts and studies discussing the discrepancies that exist between East and West German today – in regard to economics, ideology, and welfare. The fourth chapter, which I found of particular interest, is entitled “A blockaded system of government?” I found this so interesting partly because I realized how different the German government system is from the United States. 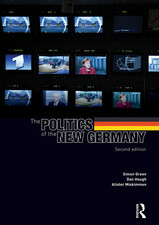 According to the book, “structurally German’s political institutions are defined by two main principles: first, they reflect that, ever since its foundation as a unified country in 1871, Germany has been a federal state, with discrete political and constitutional constructions mirroring the country’s geographical, religious and cultural diversity; and second, the political institution, and many other areas of public life, were designed specifically to make a recurrence of totalitarian rule impossible.” (page 73) What perhaps interested me the most in this chapter is that I learned about Germany coalition system. Unlike the United States, there are not two major political parties. Angela Merkel’s CDU/CSU party has a coalition with the FDP, which gives it majority in the Bundestag. The more I read, the I found myself liking this system, because it immediately creates a sense of compromise: A party knows that it will not get all of its objectives accomplished because it has power only because of its relationships with other political parties in a collation. The fifth chapter gave an overview of the political parties with a large presence in Germany. The sixth chapter, entitled “Citizenship and demographics” was also of particular interest to me, as it discussed the importance and challenges of immigration and diversity – to the Germany, which has a social welfare state and a lowering birthrate – and to the Germany, which is still dealing with its legacy of National Socialism. The seventh chapter is entitled “Economic management” and talks about the policies of the German government in the post-war times, which allowed Germany to experience the Wirtschaftswunder and a leader in the European continent once again. The eighth chapter gives an overview of welfare policy in Germany. The ninth and tenth chapters discuss Germany’s relationships with its European neighbors in the EU and with the world at large. Germany played an integral role in the creation of the European Union starting in 1951 with the creation of the European Coal and Steel Community and the Treaty of Rome in 1957. However, Germany played a key role alongside other countries, especially France, which provided a great deal of the political leadership. However, with Germany being forced to assert itself more boldly in the midst of the euro crisis, this “European identity” is under fire. A major topic in Germany and the wider world is the German involvement in NATO – more specifically, that German troops and soldiers have been sent to Afghanistan – which goes against the German hesitancy – which is pervasive in all aspects of German culture and policy - to use military force since World War II.